“Life, Liberty and the pursuit of Happiness” appear in the U.S. Declaration of Independence as “unalienable Rights,” the kind of rights that are supposed to be inherent and undeniable for citizens. These rights should never be taken away. While there is much attention given to life and liberty in American politics, the pursuit of happiness appears absent or forgotten. Happiness appears not as a right. In fact, neither our government nor elected officials acknowledge, much less put effort or legislation toward, happiness (except, perhaps, securing their own happiness). Rather, happiness emerges as something—some ephemeral thing—we pursue for ourselves. Happiness gets relegated to realms of self‐help and consumer products. We can try to be happy by purchasing books that claim to fix all of our ills by emphasizing that all of our problems reside within us. Or we can buy particular products marketed to us as the objects that can finally ensure our happiness or enable us to live our best lives. Somehow, we've forgotten that the pursuit of happiness is a right for each of us as citizens, not simply an individual struggle or participation in consumer capitalism. What would our society look like if we emphasized happiness as a right, not just an option? What would happen if we foreground happiness and pleasure as important social values? And what would this particularly do for women? Like many others, I don't often consider happiness as a right for all human beings. (I don't generally find myself contemplating the Declaration on an average day.) Partially, this is because I am nervous about how happiness is presented in our culture. Often happiness—when applied to women—is about bolstering patriarchy rather than questioning the binary gender norms we've been given. Filipovic argues being a woman today means your choices seem both to be open to many possibilities and to be restricted by gender assumptions of what women should and shouldn't do. Women have options, but those options always appear limited. Women, for instance, have higher graduation rates than men and higher admissions to graduate school, and yet, that initial success doesn't translate to women having more leadership roles at schools or a larger share of tenured positions. Anything appears possible until we learn, intimately, that it isn't. She writes, “Women today live in a world of unfinished feminism, where we are told we're equal but see our basic rights up for grabs, where we're told to just push harder at work, or recognize we can't have it all.” Empowerment becomes the language of the moment and routinely applies to only some women's successes, and particular pathways to success, rather than recognizing that maybe empowerment shouldn't be about individual successes but all of our rights. The projects of feminism remain unfinished, and women, not structure, are still blamed for our lack of necessities, particular career benchmarks or not negotiating our way out of the gendered pay gap. What The H‐Spot shows is that the problems feminists are still trying to solve today (pay inequity, affordable child care, poverty, bodily autonomy, discrimination and harassment at work, sexual assault and violence against women) all reflect the “deep hostility toward and suspicion of unfettered female pleasure, happiness and independence” in our culture. Women's happiness and independence appear as, at best, a confusing problem or, at worst, something to actively deride and combat. Why is that the case? Because the system is not made for women or by women. Filipovic notes, “[W]e're operating in a system created by men, for men, according to their whims and desires.” It's hard to succeed in a rigged system, especially a system that relies on women's free labor to guarantee that men succeed domestically, economically and politically. Women can't be happy and independent if we are expected to provide support for our world but not allowed to be full participants in it. Instead, women, especially mothers, are expected to sacrifice ourselves—our desires, aspirations, bodies and even lives—to keep others happy. There are social and cultural expectations (and rewards) for mothers to appear as martyrs, who serve others and never themselves. Women's labor goes unnoticed and unpaid because our labor makes the system run. In many ways, The H‐Spot is a hard book to read because it is an interrogation of current political situations and power alongside interviews with all kinds of women who are struggling with cultural expectations while also trying to survive. But mostly, I think it is Filipovic's commentary on what womanhood means in our current system that makes it such a challenging read. To be a woman, she writes, is to “give until it hurts,” which is a line that won't let me go even weeks after first reading the book. 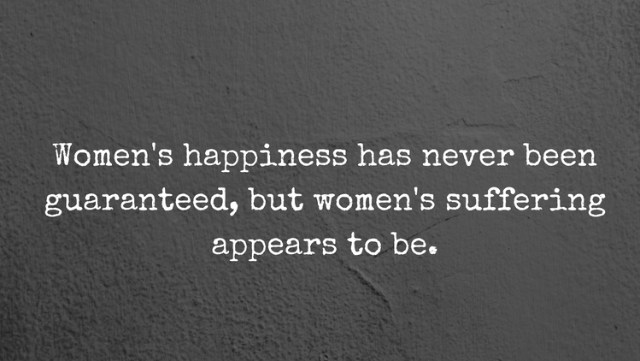 Women's happiness has never been guaranteed, but women's suffering appears to be. But that doesn't have to be the case. Filipovic argues compellingly for happiness to be a political goal and for us to reimagine laws and politics to prioritize feeling good. Centering on women's right to happiness might be a way to topple the patriarchy by refashioning family life, work, politics and governance to include women as full participants—no longer support, but full citizens whose rights matter.